July | 2011 | How Can I Keep From Singing? Well – there was a sale I couldn’t beat and since I am struggling with Nathan’s death anniversary coming up anyway it seemed to make sense to go ahead and make the final photo book with Nathan. I was going to try to share it here, but the service makes you sign up and also, it just seemed a little too private for a completely public forum like this. In the end..I didn’t put the worst of the pictures but put the ones where is he doing something interactive even if he looks bad. I put in his obituary and the program from the funeral along with pictures of the girls from the day of his funeral. If you recall, I wrote about the physical manifestation of my grief a while back here. I did have an “attack” a few days after Nathan’s funeral and then was relatively well for a while after that with occasional “episodes” that I though were medical and now think were caused by anxiety/grief. It seems that instead of the passing of time helping, it is getting worse. One of the things is my startle reflex which gets really overactive. I had a bizarre jolt driving home from the airport where there was a slower car in the lane in front of us and I saw it and let out a big gasp and nearly startled Luke into an accident. Really small things cause a huge overreaction at the base level, before I have control over them. It is crappy. Passing Nathan’s birthday and approaching his date of death has me at the verge of tears and experiencing some of these things. It is really frustrating because I am planning some things where I have to be “on” and the thought that my mind/body may betray me is really depressing. I do not like being weak and vulnerable. More than that – it is just not my personality. I guess you might say no one likes that, but it really is just not me. 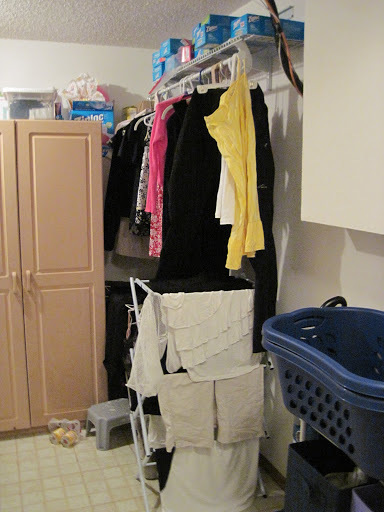 My friend Lori visited not long ago and told me how she rearranged her laundry room to avoid piles of clothes around the house. I LOVED the idea….more on what it was later. What we have done for our whole adult lives is to do laundry, usually all the loads in one day and dump in on our master bed to fold. Often, we are too busy and it gets stuffed back into laundry baskets. Then some might get folded but the hanging stuff would get thrown on the benches at the end of our bed to be hung up at some point. That point happened rarely. Our bedroom was always filled with laundry. The drying wrack was usually in the basement/office area and Luke used a baby gate to expand the hanging space. The laundry room was the dumping ground of the whole house. 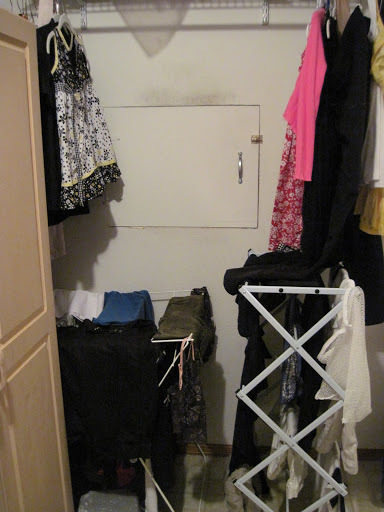 We have a crawl space whose entry is a 2.5 foot door about 3 feet of the ground. You have to launch yourself in there. So – whenever something needs to go in there it sits in the laundry room for a while. We also keep our luggage under the stairs. We had a hamper that held all our paper goods instead of laundry and a garment rack that sat on the floor and would get piled with stuff at the bottom. I owned at least 4 vacuum/steam cleaner type of machines which all lived there as well as all our extra pillows and various other linens. There was also a very old high chair that my dad used as a kid, wrapping paper, light bulbs, ziploc bags etc. Oh and parts of a bed frame. So – we took everything out of there…every single thing. It filled up half of our basement. Then we bought shelves. We bought enough shelves to hold all our folded clothes on. I also bought cloth baskets for socks and underwear and a bin for mismatched socks. 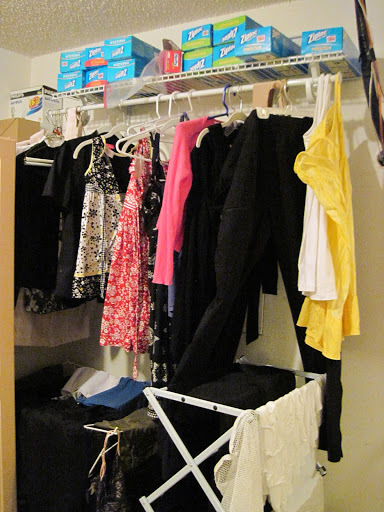 We found a wall-mounted garment rack that has a shelf and bought an additional folding wrack to dry clothes on. Lastly I bought some smaller clothes baskets so that the girls could carry their clean clothes three stories up to their rooms. That is the idea, that once there are piles, they bring them up and put them away and bring the basket back down. 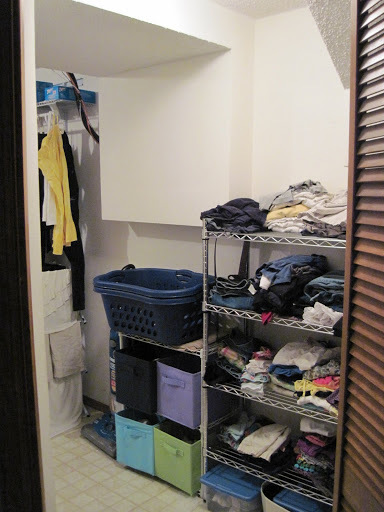 Clothes that come out of the dryer are hung or folded IMMEDIATELY right in the laundry room. It really only takes 5 minutes or so and it is amazing how much easier it is to just fold one load at a time. 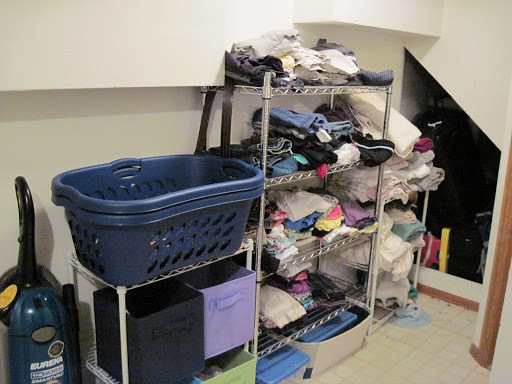 So – no more piles of laundry in the house! 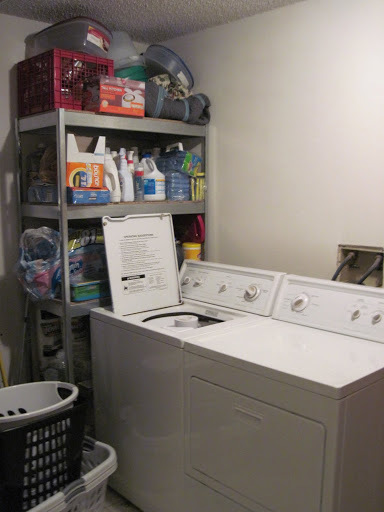 No more long-term dumping in the laundry room because the system is in place and anything waiting to go into the crawl space will be very apparent and more likely to get put away sooner. The paper goods are on a shelf by the washer that I had, but was full of stuff I didn’t need so I threw away a bunch and made some room. I have enough space to have one large pack of each paper good item (from costco etc) but not more than that, but that is fine. I am getting rid of some of the vacuum things and moved the steam cleaner to an empty space in the garage since I hardly ever use it. We got rid of a few luggage items and all we have fits nicely in the space now. So – with that I will give you the pictures…everything full from yesterday because of all the laundry from our trip. In a day or two the shelves will be empty. Posted on July 9, 2011 | Enter your password to view comments.